Azalea and her younger sisters dance in the mysterious silver forest every night, escaping from the sadness of the palace and their father's grief. What they don't understand - although as time passes they begin to get an inkling of the danger they are in - is that the mysterious and dashing Keeper is tightening his snare with deadly purpose. 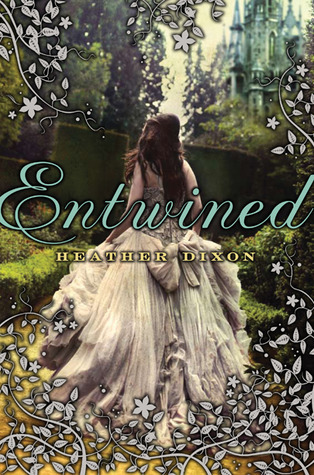 Lush, romantic, and compelling, this debut novel by Heather Dixon will thrill fans of Shannon Hale, Robin McKinley, and Edith Pattou. 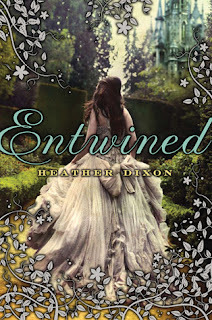 Entwined is a retelling of the Brothers Grimm tale of The Twelve Dancing Princesses. Wikipedia has an overview of the original tale here. The girls are all named after flowers in Dixon's version - Azalea, Bramble, Clover, Delphinium, Evening Primrose, Flora, Goldenrod, Hollyhock, Ivy, Jessamine, Kale, and Lily. Azalea, as the oldest, is left in charge of her eleven sisters after their mother dies and their father, the king, leaves for war in a distant land. The girls are left all alone save for Mr. Pudding, who works for the household, and are forbidden to leave the castle, for they are a house of mourning for the next year. The worst part, even worse than the all-black clothing and the darkened windows, is that they are also forbidden to dance. When Azalea discovers a secret passage that leads to one Mr. Keeper and his dancing pavillion, the girls think that they have hit the jackpot. As time goes on, though, Azalea learns that Mr. Keeper is not the nice man they all thought he was - in fact, he is downright scary. And she doesn't know if she can keep her sisters and herself out of his clutches much longer. I thought Dixon handled this retelling fantastically. Fairytale retellings are often overdone, with the author either straying way too far from the original tale or not straying enough to really consider it a separate story. Entwined, though, dances perfectly on that delicate line. Azalea isn't quite your typical princess - while she does have a few fainting spells here and there, she is in no way weak-willed and in fact has quite a fiery spirit. She has to be strong for her sisters, who are all also strong-willed like her. Fans of Robin McKinley should enjoy this novel. I read this ARC too, and I really enjoyed it. It's not a fairytale I was familiar with, but it was a easy, magical read. Great review!